The planning approved outline permission for 200 houses to be built at Milford Golf Course will have a severe impact on Station Lane. Traffic Studies project an extra 831 vehicle movements to and from the new housing estate. That will add 16% to the total number of vehicles using Station Lane. 30% (1267) East to Cranleigh or South to Horsham. The direct route West to the A3 or Milford station for those 3380 cars per day is via Markwick Lane and Station Lane. Markwick Lane is currently 2700vpd so that 3380 increase represents 125% to 6080vpd. 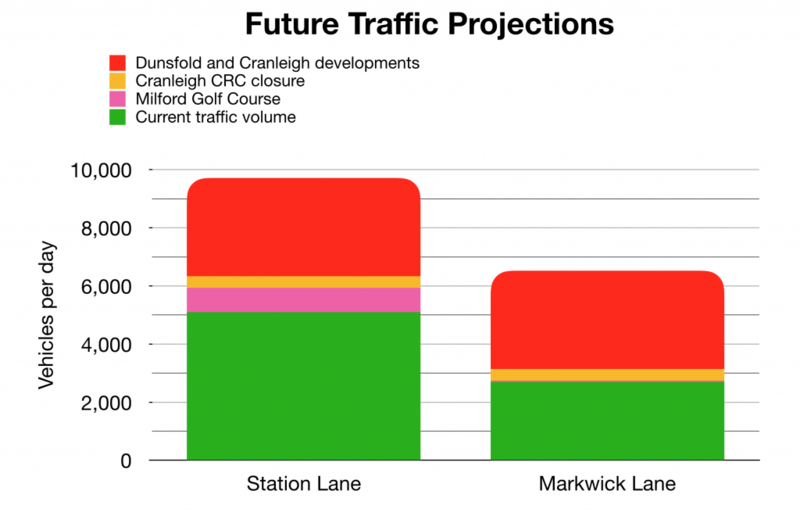 When applied to Station Lane with a current flow of 5100vpd that extra 3380 vehicles is an increase of 66% to 8480vpd.